It must be fun to be on Sir Richard Branson’s creative team. They throw ideas out there, and most of the time, it seems, Branson’s game. Take Virgin’s latest plan to launch in-flight live music and improv comedy. 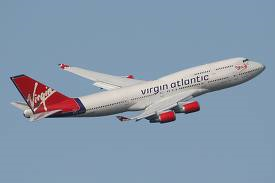 Little Red, Virgin Atlantic’s domestic carrier for the United Kingdom, plans to have musicians and comedians take to the aisles at 30,000 feet. The new London-based airline, which launched on March 31 this year, will be offering live shows on flights to Edinburgh or Manchester. Called Little Red LIVE, the lineup will feature comedy in August and acoustic music in September. The talent will include performers from the Edinburgh Fringe Festival, the world’s largest arts festival, which runs through August. “Acts will be announced soon through Virgin Atlantic’s Facebook and Twitter channels, but flight details will remain a secret — making this a truly one-of-a-kind experience,” announced the airline in a statement on Wednesday. We don’t want to appear too cynical — anything that might make the chore of air travel better is worth trying — but in-aisle comedians? For those of us who like to switch off, tune out and watch a movie or read a book on board, this could prove one laugh too far. Thankfully, the flights in question are 90 minutes or less. Would you like live entertainment on your flight? Tell us in the comments section.